Ever have that warm feeling tickle you when you smell that bread baking in the oven? I always do.. not just at home but even in the bakeries. I start feeling hungry & want to touch & feel that warm, soft loaf. Yeah! it’s that romantic. From not ever baking to bread… I am here today where making bread at home is theraputic for me. I love the Rustic breads with a crust top & full of flavors inside. One of these are the herbed bread. Last week a dear friend of ours got us a whole bunch of Rosemary from his garden. I used it in pasta, made some oils. With so much fresh herbs still there I though they would be best used in a bread. This the first time since I started baking that I did not follow any recipe. I used my own measurements & followed my mind quite prepared to have a disaster! But it was not a disaster & I am not ashamed to say that I was very very excited to see the way it turned out! The best bread I ever baked! So here it is, a Rosemary & Pepper Peasant Bread. Sending it for Think:Spice hosted by Divya of Dil Se started by Sunita. Mix the Oil, Chopped Rosemary & Ground Peppercorn & cover & keep it overnight for the flavors to enhance. (you can make this is a bigger quantity & use it as herbed oil & may be for dipping the bread in it). Take half cup of warm water & dissolve the sugar in the water. Add the yeast to this & let it foam up & do it’s part. Mix the salt, Bread Flour & the Wheat Flour. Add the herb & pepper with the oil to this & gently combine. Add the yeast water & the 1.5 cups of water & make a dough. Knead for no more than 10 minutes. It will be a soft dough. Coat it with some olive oil, cover & keep in a warm place for about 3-4 hours till the amount doubles. Punch it down & Divide the dough in to 2. Shape them into Ovals or Rounds. ( I did a big oval, a small round & 2 little bun sized for my two kids). This is an optional step just for the looks.. you may skip this. Make a shallow slit on the top about 5 inches long… pinch both sides of the slit, pull & spread it out on the sides like wings . Make slits like a cross on the top of each loaf. Slightly brush with Olive oil & sprinkle with more Rosemary, Pepper & Sea Salt. Lightly Cover the dough & let it rise for another hour. Pre Heat the oven to 400 Degrees F. Bake for about an hour or till the top is light brown & crusty. The bread will sound hollow when you tap it. That comforting aroma… It was a lovely, hearty bread. A thin layer of crust on the top & flavorfully soft & chewy inside. The pepper added that slightly warm feeling. I made some dipping oil with more black pepper & herbs. We had it with some vegetable bean soup, for dinner. Sending this For Susan’s YeastSpotting & Ben’s Homemade#2 Bread. And a wonderful presentation there !! Interesting!The thought of freshly baked bread with some hot soup warms me up 🙂 Nice presentation and wonderful clicks ..
yeah, I l love the aroma spreading the entire house when bread is being baked. nothing like fresh, soft bread baked from scratch. awesome pics soma. can u please send some over ? Just perfect for a rainy day to make you cozy and warm all over. I know exactly what you mean about the smells of freshly baked bread. and this loaf is just perfect. I always love to punch the dough and roll it, love the softness. The bread is very aromatic and lovely pic. Love the recipe, Soma. I’m surely going to try this. Will let you know how it goes. Guess what! I made the Phirni again for some guests tonite, and it worked out beautifully again! The smell of bread baking in the oven absolutely makes my day. This peasant bread looks delicious, Soma. I wish I could have some right now! Everything you make is so enticing. This bread sounds awesome – I would love the rosemary flavor! Yum! Another lovely recipe and beautiful picture from you Soma. I too am on a diet and trying hard to resist temptation by visitng lovely food blogs. 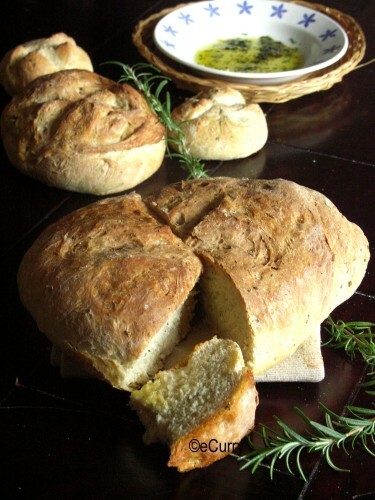 Soma, the bread’s gorgeous…a nice offering to the dinner guests until the meal is ready. 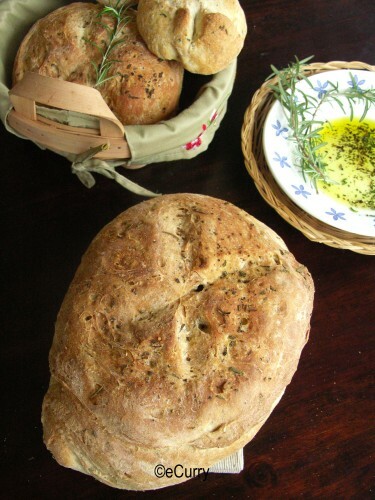 Love the flavors that herbs bring out in any dish..Absolutely perfect and tempting bread.. Fantastic bread and fantastic spread….I too love to fill my lungs with that sweet/yeasty smell of freshly baked breads,while i pass across the Bakery that is in our lane. simply incredible soma! love the sound of this! YAY for you Soma. Fab bread. I’m still looking for rosemary seeds here. That bread looks rustic & delicious! I love bread, especially spiced/ herbed breads. As for the aroma of fresh bread baking, it is second to none! WOw soma the bread looks really rustic and so so delicious. Till now never made spiced bread, should try them. Dear Soma, I get a warm feeling simply by looking at your pictures! They’re really lovely and atmospheric. Hey, I made thepla at the weekend! It was fun! Oh I love the smell of bread also. It does make one hungry. I am also working on baking breads and I have had many disasters, but I am getting there. Congrats on baking a great bread without the help of a recipe! It sure is difficult. Soma, Soma, Soma! This is awesome! 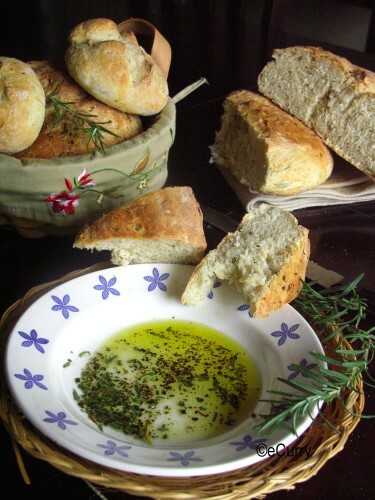 Fresh baked bread and dipping oil! Oh My!! Nothing quite like fresh rosemary, nor quite like having you own recipe be the best one ever. Looking fabulous! i love love love the aroma of fresh baked bread. Baking bread without a recipe? Now that is amazing, hoping to see more breads from you Soma. It looks incredibly comforting and warming Soma! Peasant food is always so delicious isn’t it! this looks gorgeous soma! love the spiced bread idea. it’s a while since i made bread. this looks yummy. Wow Soma! This is an amazing loaf of bread. I always get that tickle when I smell bread being baked. That’s one of the best feelings a food lover can get, right? Soma, I love to come here. Your pictures are enchanting and your recipes make me want to expand my cooking horizons. I’ll have to give your bread a try. Wow….the pics are so good! Totally droolworthy. The crust and crumb were great. I baked it in Jamaica so next time I will have to use half the peppercorns because the taste of everything here is very strong. I will surely try this again! Thank you so much for letting me know after you tried it.. The real test is when someone else does it & likes it too! I can understand that fresh ingredients do have stronger taste, & u are fortunate to have such fresh ingredients available. Thanks again & I am glad that u liked it. This bread looks and sounds delicious, will have to give it ago sometime when I have some fresh rosemary around. So impressive how they turned out considering that you did not have a recipe. The photos look great! Wonderful recipe. my kinda bread! Thanks for sending it to Think Pepper event!